Now it was war and regular fuel was hard to get by. But electricity was still available and the Rotterdam city grid had a night time rate of only 2 cents (of solid Dutch guilders) per KW. So, unlike companies in modern times, Netam never had the environment in mind when they picked up designing electric cars. The move was born out of economic necessity: the lack of fuel. Netam’s engineer Stein in 1941 designed both a small panel van that could carry a maximum load of 750 kilos as well as a passenger car, carrying four people, on the same chassis. Electric engines were acquired from the Smit-Slikkerveer company. These 3,6 hp engines were fed by a dozen 6 volt batteries (resulting in a total of 72 volt) and gave the vehicle a speed of around 30km per hour. An ingenious (and silent) propulsion system was built in the floor of the cars. Battery loading time was around 16 hours and the range of the cars was between 50 and 75 km, which is not bad even at today’s standards! The cars came with an interesting option. If the international situation would improve and normal fuel would be available again, it was possible to replace the electric engine with an air cooled internal combustion engine. The Netam-L-Car’s Turning cycle was just 6,6 meters, so it was well suited for urban transport. 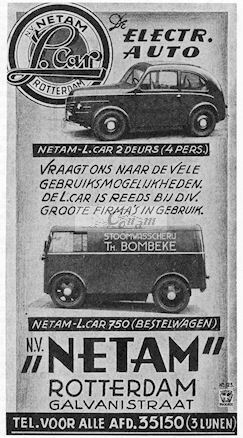 Everything indicates here that the Netam-L-Car was a highly versatile concept. 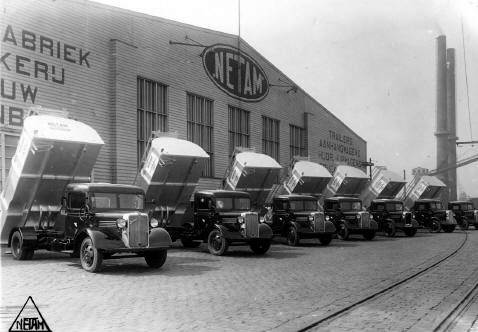 Netam set out to produce a first series of 12 panel vans by 1942 at their Galvanistraat factory. The van was offered also as ambulance and taxi. But shortage of material soon halted production and just five Netam panel vans were delivered, including one built up as a hearse. The remaining seven were commandeered by the German occupation forces, for use on the Atlantik Wall. The passenger car prototype was sold to an unknown user in the region. After the war Netam returned to its business of trailer and tipper manufacturing and, after a merger with Fruehauf, continued to do so until 2002 when it filed for bankruptcy. More technical details of the Netam-L-Car can be found in M. Wallast, Historisch overzicht van de Nederlandse Automobielindustrie, 1979, Den Haag.